Your search for the perfect brownie is officially over. These dark and decadent, gooey, and oh-so-chocolatey fudge brownies are something that must be experienced as soon as possible. 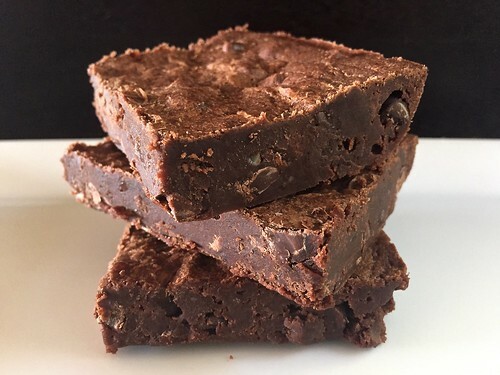 Imagine sinking your teeth into a chewy, deep, chocolate brownie combined with an intense creamy fudge, splashed with chocolate chips, and why are you still reading this? Go to the kitchen and start baking these glorious delights right now. Sometimes you just want pure chocolate. And although there’s nothing wrong with adding walnuts, or caramel, or raspberry swirls to a dessert, this one does not need it, allowing you to fully enjoy the depth of this rich and chocolatey indulgence. Though, we have to warn you, this recipe is both a blessing and a curse: once you bring these to a party, your friends will never let you bring anything else again. This is probably our most-requested recipe, and it’s easy to see why. The standard reaction upon eating one of these is a moment of bliss: eyes closed and a deep contented “Mmmmmm!” There is a reason for this. 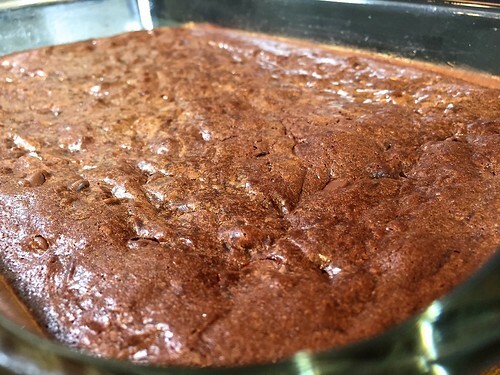 When you blend three types of chocolate – unsweetened, dark, and semi-sweet – they meld together into the perfect brownie that will satisfy every chocolate-lover. We have slightly adapted this from Gourmet Magazine, adding a heaping teaspoon of coffee crystals. Most people won’t even consciously taste it, but it deepens and expands the chocolate flavor without being distracting, and is the secret ingredient that sets these brownies apart. 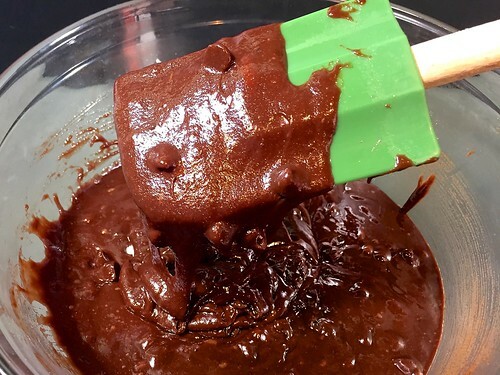 The other change we made will require a bit of patience: when these beauties sit overnight in the refrigerator, they settle into a thick fudge-like texture that is best enjoyed chilled. Your willpower will be tested when these emerge from the oven, hot and fragrant, but they improve so much overnight that your self-control will be richly rewarded. Of course, if you simply can’t wait and need a quick fix while they’re still warm, we won’t tell. Preheat oven to 350°F. Grease a 9×13-inch baking pan, and set aside. 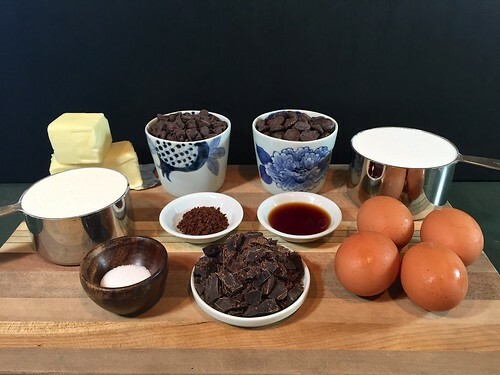 In a large heatproof bowl set over a pot of simmering water, combine the bittersweet and unsweetened chocolate with the butter and coffee crystals. Stir frequently until the mixture is melted and creamy. Remove the bowl from the pot, and set it aside to cool to lukewarm. When the mixture has cooled, stir in the sugar and vanilla until blended. Then add the eggs, one at a time, stirring well after each addition. Then add the flour and salt, stirring just until combined. 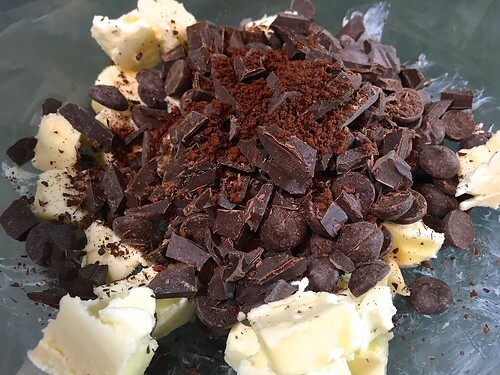 Finally, fold in the chocolate chips. 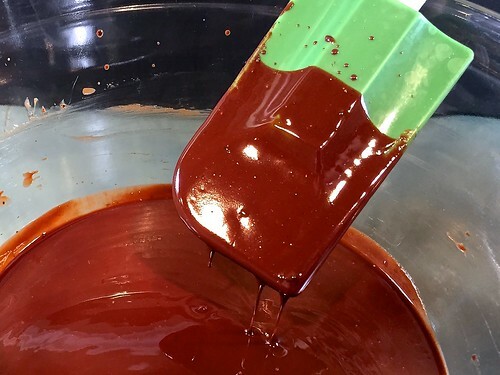 Pour the batter into the greased baking pan, and smooth the top to an even thickness. Bake for 25 to 30 minutes, or until a toothpick inserted into the center comes out with a few crumbs sticking to it. Let cool completely in the pan, then cover and refrigerate overnight. Serve chilled. Hello Carol! So nice to hear from you!! Since we are vegetarians, we have actually made that recipe with tofu instead of shrimp and it was delicious! That recipe has always been one of our favorites too! We made these last night. 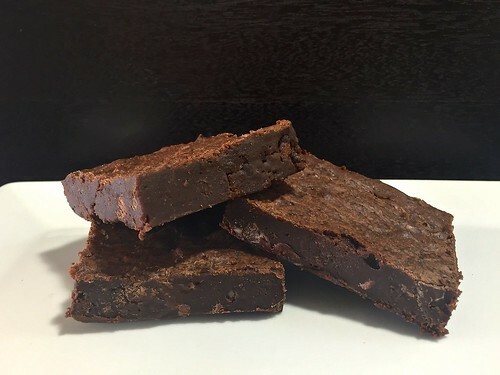 They are THE BEST homemade brownies we have ever tasted!!! SO YUMMY! We are bookmarking your site and look forward to more yummy recipes!! Hello Naseem! We are SO happy that you made and enjoyed these brownies!!! We have a lot more delicious recipes coming and we look forward to sharing them with you! Hello! This brownies must be delicious! I’m looking forward to seeing more cookings on your site. Thank you, and hello in Bucharest! I am so happy to have found your page… I want to make everything.. 🙂 but I really want to make these amazing brownies. I have 2 questions please … 1- unsweetened chocolate does that mean 100% chocolate ? And 2- if I wanted to add caramel how much and would I just swirl it ontop ? 1. 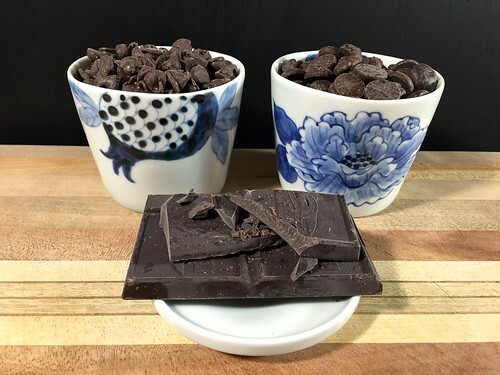 Yes, unsweetened chocolate is the same as 100% cacao. The only ingredient listed on the package should be chocolate, that’s it! 2. The caramel sounds delicious! We’ve never tried that but it should work! Try drizzling it over the batter just before baking, and swirl it gently into the batter using the tip of a knife or a toothpick. As for the amount, try starting with maybe 1/4 cup of caramel and see if it needs more? Let us know how it turns out! I made these for Thanksgiving but needed to make some substitutes due to the hosts being gluten/sugar free. We used Lily’s Stevia sweetened chocolate chips, and sprouted flour. Fantastic recipe! And…much better cold. Woohoo! We’re so glad you enjoyed the recipe, and that’s great that the substitutions worked so perfectly! We’ll keep that in mind the next time we need to make a gluten/sugar free dessert! Thanks for letting us know! Jillian brought these to a holiday party and we all loved them and begged her for the recipe! Can’t wait to try them.